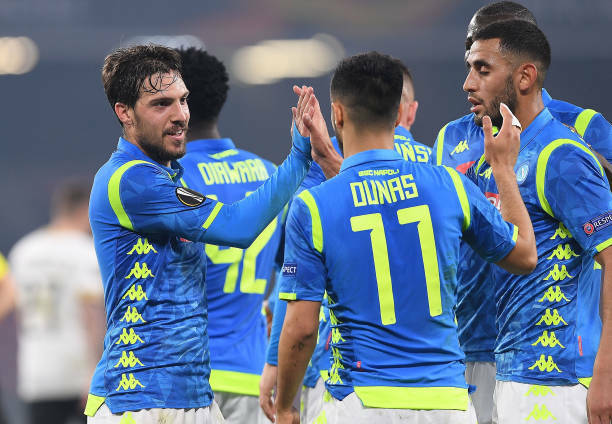 Napoli and Inter Milan faced no issues as they both sealed their places in the last 16 of the Europa League. Salzburg, Eintracht Frankfurt, Villarreal, Dinamo Zagreb, Zenit, Benfica, Kiev, Rennes, Krasnodar and Slavia Prague also all made it through on an action-packed Thursday night across Europe. After a 3-1 away win in Switzerland last week, Napoli easily advanced 5-1 on aggregate. Napoli coach Carlo Ancelotti made it two wins from his first two games in the Europa League with a 2-0 home victory over Zurich. Forwards Simone Verdi and Adam Ounas scored in each half at the Stadio San Paolo. Meanwhile, Inter advanced after eliminating Austrian club Rapid Vienna 5-0 on aggregate after winning the second leg 4-0 in Rome. Former champion Sevilla advanced after knocking out Lazio on Wednesday. After four consecutive draws in all competitions including 2-2 at Shakhtar Donetsk last week in the first leg, Eintracht Frankfurt celebrated a 4-1 victory and advance 6-3 overall. Forward Luka Jovic scored his sixth European League goal this season for a 1-0 lead in the 23rd. It was 2-0 just four minutes later after Sebastien Haller converted from the penalty spot. Haller added his second and substitute Ante Rebic also scored late in the game. Rennes made the next round 6-4 overall after a 3-1 away win at Real Betis.